A Multi-National company is looking for a (3) three Sales Executives to join their Dubai office. 1: The candidates must have excellent fluency in English. 2: Other Languages Hindi, Russian, Italian will be an Advantage. 3: Smart , Energetic and flexible. 4: Good Looking, As you will represent the company. 5: Fast learner and passion for sales. 6: Self-motivated with a results-driven approach. 8: UAE Driving License would be an advantage but not necessary. 9: Conduct market research to identify selling possibilities and evaluate customer needs. 10: Actively seek out new sales opportunities through visiting, cold calling, networking and social media. 11: Set up meetings with potential clients and listen to their wishes and concerns. 12: Prepare and deliver appropriate presentations on products and services. 14: Ensure the availability of stock for sales and demonstrations. 15: Negotiate/close deals and handle complaints or objections. 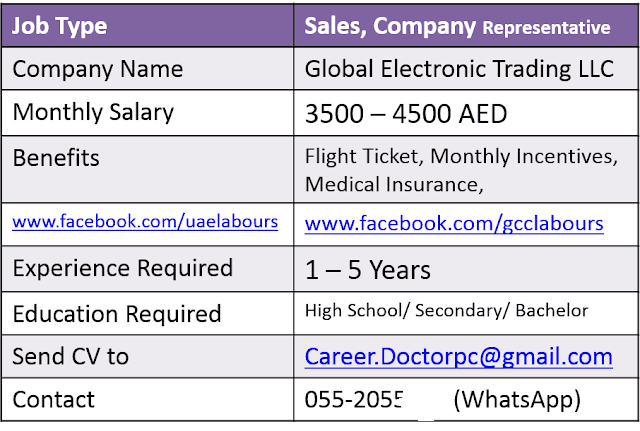 Salary: 4500 – 6500 AED but not fixed (Salary is a subject to be discussed on the interview with the direct management of the company and will depend on mutual agreement as well as on experience in the same field). Benefits: visa will be provided to selected candidates, other Benefits including Salary + Attractive incentive + Medical Insurance + Flight Tickets + Gratuity + Annual Leave Salary, Telecommunication and Transportation will be provided by Company. Note: This Job is for Candidates who are located in UAE, Candidates on husband & father sponsorship can apply too, only Shortlisted candidates will be contacted for face to face interview. Interview Location: Dubai Office Located in (Al-Garhoud) near to GGICO Metro station (5 minutes walking). Interview Details: will inform candidates through Mail after selection. Send Your Updated Resume to above mention Email Address with Latest Passport Size and Full Body Length Photographs taken recently. Admin Request: Please do Share with those who are looking for Confirm Jobs, Hundreds of Expats are looking for Jobs across UAE, Your 1 Share is enough to help someone.